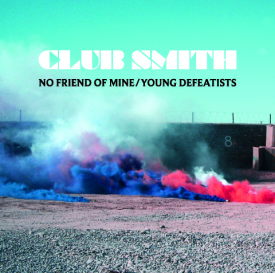 Club Smith's video for "No Friend Of Mine" is now live. We brought news of the to-be-released double a side single back in January. The video features Club Smith's Sam Robson seemingly giving someone a pasting, you'll have to give it a watch. Another point of note is that Sam went through a stern 3 months of training for this video. In terms of the music however, who said guitar music was dead and who said The Vaccines were it's saviour? Maybe people need to think again, this new double a side packs a punch. To hear the B side "Young Defeatists" go here. Watch the video below and cop the single from the list of stockists on Club Smith's official site.